Hi all and happy New Year! Things have been a bit quiet around here for the last few weeks because we’ve been on holiday and also we’ve had our heads down trying to nail down how we’re going to get this game finished so you can play it! We now have a schedule that we’re going to try to follow for the next few months that takes us through various milestones like pre-alpha, alpha, beta and so on. And, when the time comes, yes, we will be calling for testers to come in and help us evaluate and stress test the game. And, no, I don’t have a date for that yet! Rest assured we’ll let you know as soon as we have one. In the meantime, what have we been doing? Quite a few things actually! For one, we’ve pretty much finished off the battle part of the game, rounding things off with card and figure animations and other bits of polish like terrain modification (very cool). The only thing missing from there now is audio. Another thing we’ve been busy with is the shop and deck builder, which I’ll talk more about over the coming weeks. And I’ve been spending the last couple of weeks on the tutorial (which you’d know about if you’ve been following our new twitter feed). That’s a huge picture, so you’ll probably have to click on it to see what’s going on. This is the central hub of the game that you see when you log in and, as you can probably tell, everything is represented by a geographic location on this map. The map is huge! 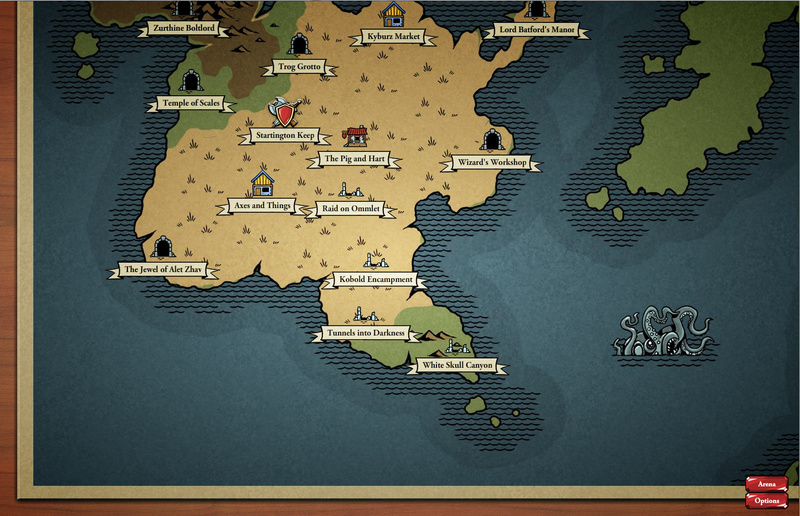 You can drag it around to see other parts of the world – which will get revealed as you progress through the game. You can see from the map above that I’ve completed the “Raid on Ommlet”, “Kobold Encampment”, “Tunnels into Darkness” and “White Skull Canyon” adventures, but not any of the others. You can always go on those adventure again, but you can only get experience points once from each adventure (for each character in your party), so it’s important to see which ones you’ve done. There’s also a whole achievement system for adventures that will be shown along with them, but we haven’t done that yet. Shops also hang a little banner out the front when they get new stock in to let you know. It’s worth noting that there’s no “travel time” in the game. You just click on the location to go there. You don’t have to walk around or anything. The “Pig and Hart” is the first tavern you can visit and it’s where you’ll find your starting adventure party. Finally, the shield you can see on the map obscures your “home” keep where you go to look at and organise your collection of items. That shield is “where you are” at the moment. If it’s sitting on top of an adventure, it means your party is out on that adventure and moving them to a store or tavern would interrupt it (which you can do, but you’ll lose your progress). Finally, you might have noticed the Arena button in the lower right hand corner. That’s how you get into multi-player games. Anyway, that’s the Card Hunter world map. I hope it proves to you that we haven’t just been stuffing our faces with Christmas cake and boozing it up over the holidays. Although there might have been some of that going on too. This looks great! I’m excited to see each new piece of information. I like that we’ll be able to have multiple characters so we can organize a specialized party for each adventure. Looks kinda small, is that just a portion of the map? Looks like it scrolls upwards. Where do i sign up for the pre-beta-pre-registration? Great ! Hope for open-beta ! With each journal that comes out, I get more and more excited about this game. It’s looking great! That huge octopus/sea monster scares me.. If I’ve beaten an adventure already, and then I hire two new characters, I can play that adventure again and the new guys would get experience but the one who’s seen it all would not? looking good! But how will the Exp Multiplayer system work`? We’re still playing around with the experience system but the current plan is that each character can only get experience once from each adventure. If you went back and played an adventure again with two new characters and one old, the new ones would get the experience, but not the old one. Multiplayer doesn’t use levels as it would make the playing field too unbalanced. Just out of curiosity, will the game be downloadable or browser-based? Keep up the great work guys. Oh, and of course I have the ever-present question about the beta. It is early 2012 and I think everyone is anticipating. Any new news? My only real gameplay question at the moment, if you’re willing to say yet, is are you using an “energy system”? That would be the only thing I can think of that may make me reconsider supporting the game as I find them extremely annoying. @Phantom Mouse: there’s no energy system in the game. Very glad to hear that there’s no energy system! I’ll most likely be supporting with cash from gift cards when possible (take care of my mother and that’s the method she uses to pay me) if nothing else, just to support that one decision. Of course, the better the game the more cash I’m willing to spend. Hey, i don’t want to be an as*ho** but early 2012 is january and feb you are talking about a plan to a pre-alpha LOL, plans ? Why can’t you be honest ? We are already in 2012 and you still talk about plans whithout any confirmed dates ? Will there be any procedurally generated content in the game? Specifically random dungeons? Or is it all hand-developed? Looks great, can’t wait to play it! @Monster Player – yes, I know we’re behind schedule… sorry. We probably should never have mentioned even rough times we were aiming for. @BigWeather – good question. There’s no procedural content at the moment, but it’s certainly something we could add – like a survival mode for example. The procedural mode might be good for multiplayer too. It’d take out the map memorization that could potentially become a barrier to getting new people in the multiplayer environment down the line.